Easy Zesty Italian Pasta Salad that is the perfect side dish to any meal! 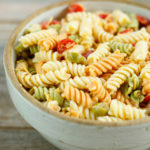 Customize this tri-colored pasta salad with your favorite veggies for a unique flavor. Cook the pasta. Drain and run cold water over the pasta. Add pasta to a large bowl and mix in the Italian dressing. Gently add the tomatoes, olives, and cheese. Cover and place in the refrigerator until it is time to serve. This recipe is best when made the night before dinner. For extra crunch, add about 1/2 of a cucumber (chopped).